Welcome to NotTober, the month that, in all but three of their 23 seasons of subsistence, signals the conclusion of the Colorado Rockies baseball season. 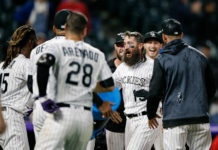 Of course, the Rox season is usually over long before October and this year was no exception, with the usual May fade and June swoon effectively ending the Blake Street Boys’ (Among Men) season before the summer solstice and ensuring their third last-place NL West finish in the last four years. I know, I know. No one writes about baseball in October in Broncos Country. It’s like growing red wine grapes in Germany. And everyone gets momentarily hot and bothered in March and writes about how the Rox didn’t make any significant offseason moves but how, if everything goes just right, they’ll be contenders this season. And pigs will fly first-class. But since there is virtually no Hot Stove League in Denver (see below), now seems like the best time to write about baseball. Fill a void, so to speak, although perhaps a void that few see the need to fill. I’m tired of everyone trying to fix the Rockies and I don’t feel irresponsible for accepting their losing ways. I’ve learned over the years that winning is overrated and overemphasized in our culture. It beats losing but you can’t win all the time. And I was attacked for those words. “Un-American!” “Loser!” [“Sissy.”] “Democrat!” It appears that fixing the Rockies is not only an inalienable right but also a civic responsibility. Ridicule, as the man once said, does not a comfortable overcoat make. But, I have since seen the light. I have been to the mountain. My trip to the Baseball Hall of Fame (see September MHSM, “Stepping Into the Bucket [List]; Pencils Hits the Hall”) has changed my perspective. As noted last month, I won’t try to fix baseball, but the Hall did remind me what was right about the old game and wrong about today’s version. I will, however, offer my suggestions on how to fix our local nine. So, after exhaustive research – a three-hour, forty-seven minute Rockies’ game that was spent “sort of” watching the game but more importantly talking to my Coors Field constituents on The Rooftop, in front of Helton’s Burger Stand, and in line at the kids soft-serve ice cream stand – here is my Presidential Platform. First things first: Fire everyone from the training staff, the coaching crew, the press and marketing folks to the front office personnel. The only way to create a new culture is to exterminate the old one, top to almost bottom. Manager: Hire a manager who won’t be surprised when he learns his star shortstop has been traded. Walt the player was one of my favorites. Walt the manager doesn’t seem to have much pull. You’ve got to have a tough SOB who would have been ticked to learn that he was the last to know when Tulo was shipped to Toronto. I’ll bring that guy in. General Manager and Assistant General Manager: (Sorry Jeff Bridich, it was fun while it lasted.) These spots will be filled by the visiting team batboy and clubhouse manager, both of whom are actually current Rockies employees. Who knows more about the other teams’ players than the guys who get their bats and gloves, shine their shoes, and get them locker room food? Plus, it will be easy for them to figure out which players get paid well based on tipping habits. Special Assistant to the GM: He’s got to specialize in baseball Sabermetrics, which is why I’m promoting the right field manual scoreboard operator. Who better knows the numbers in baseball than this guy? Stadium Operations Director: The person inside the Dinger costume, who has been all over the ballpark, hears all, says nothing, and can still be anonymous in a corner office running the ballpark day-to-day will be my choice here. Dinger will be unceremoniously dinged (“00” will not be retired) and an obscene offer (or gesture) will be made to the Phillie Phanatic. 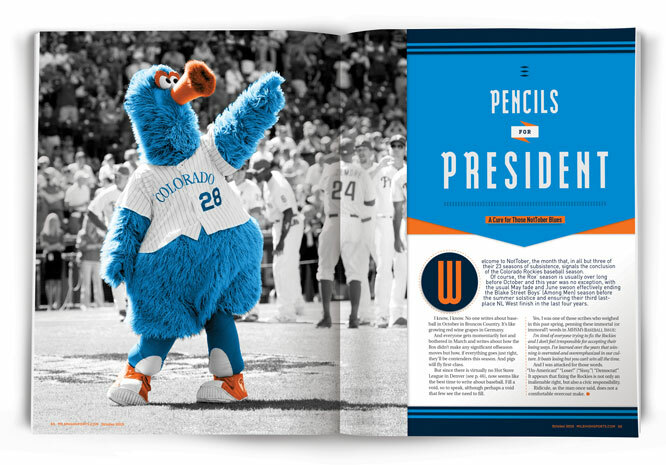 We’ll also bring Nuggets Supermascot Rocky in for special guest shots with the Phanatic, to be renamed Loopy in honor of the former Denver mayor who put the flavor back in beer. Except with the kids (who can’t vote anyway), the axing of the world’s most annoying mascot will be my most popular act and should, by itself, land me the job. Stadium PA Announcer: I’m going with the vendor they call Opera Man. We’d no longer have a need for microphone, amplifier, or stadium speakers. He could just announce lineup and bellow out player changes walking up and down the aisles of Coors Field. First and Third Base Coaches: Call in the ball boys down the first and third base foul lines. They’re the closest on-field people to the base coaches, are well suited to argue fair and foul calls, and have significantly more experience with the Rockies than the current base coaches. Also, since they already wear protective batting helmets, they can double as hitting coaches. Think of all the money we’d save on coaching salaries (EY and Stu Cole must be making a combined half mil). Pitching Coach: I’d hire Dave Duncan away from the Diamondbacks as pitching coach. I could also hire nobody, because “nobody” would come in and avoid screwing up every pitcher in the system, which would be an inexpensive upgrade. Look, for all the heat the Monforts take, it’s still a business. And business is good. Not only will I, as president, improve the on-field product, I’ll be a good steward of the business and its banks accounts. At the end of the day, we’ll need more money to hire better pitchers. Here’s how I’ll do it. Add Concerts. The first solo concert held at Coors Field, Zac Brown Band, drew a crowd larger than all but two Rockies home games this year. Solution: 81 home baseball games, 82 home concerts. It’s an ingenious way to maximize revenue over all 162 days in the major league baseball season (plus one date to cover rainouts). Transform the entire upper deck into the world’s biggest party deck. Nightclubs, theme rooms, fine non-chain dining, fast foods, amusement park, roller coasters, water rides and petting zoo. Am I missing anything? If I am, let’s schedule a meeting to discuss it. If the party deck in right field generated eight figures in its first season, there’s no reason this plan for the entire upper deck can’t fund the entire pitching staff. Hire kids who graduated last in their class at Harvard Business School, Wharton, and Greeley West to run the business operations of the Rockies. Pay them intern wages to perform all the business analytics necessary to maximize revenue and cut every last cent of costs in this modern age. When not overheating their computers, the recent grads can host parties on the Rooftop Deck, write press releases and sell beer. Change the name of Coors Field to Echo Park, after the burgeoning Echo Brewing Company in Frederick, Colo. Since the craft beer industry is growing at double-digit annual rates in Colorado, maybe it can use some of its marketing expertise to grow the Rockies fan base at the same rate. And in the worst case, my constituents will have better ballpark beer. Ax DJ Otzi’s rip-off “Hey Baby” 7th inning stretch song. In its place, let’s go with Linda Ronstadt’s “Carmelita” (“I’m here in Echo Park… and I’m all strung out on heroin on the outskirts of town…”). The kids will love that one. Open Seating. If you bother to show up to my game, and you want to move down to fill up the seat belonging to the guy who didn’t, great. If he shows up, you’ll have to move, but no longer will fans seeking a better vantage point be treated like felons for sneaking down a row or two. New uniforms. Orange and blue. Hey, if it works for the Broncos… And full socks with vertical stripes, please. Unplug the humidor. We were the original “Deflategate” and now Tom Brady and the NFL get all the pub; what a copycat league. I will make a trade: The humidor to the New England Patriots in exchange for the two equipment boys to get the air “just right” in the baseballs for our pitchers at Coors Field. If elected President, I would even support a coup d’état, or at least a leveraged buyout of the ownership group to bring greater value to all my constituents (like black market October home playoff ticket prices and reasonably priced concessions). Perhaps Professor Bob the Beerman, who’s been around the Rockies since Day 1 (and wears Vendor Badge No. 0001) could head up the ownership group, along with the private equity guy sitting behind home plate, the corporate lawyer who sits in the row in front of me, three DraftKings Fantasy Sports pros, and my bookie’s accountant from the tough side of Brooklyn. These guys can make the owners an offer they can’t refuse. While tempted to try to lure Clint Hurdle from Pittsburgh, I think for job security, I’ll hire Josh “Hoodie” McDaniels for a return engagement in Denver as Rockies manager. After all, a fall guy will be needed if none of this works out.